03 Mar 2015 Comments Off on W-62: Forgiveness is my function as the light of the world. W-62: Forgiveness is my function as the light of the world. Forgiveness and salvation are two ways of saying undoing. Undoing darkness produces Light. Giving darkness to the Holy Spirit is my function. It is an uncluttering of the mind. Uncluttering the mind leads to spacious unknowing. Not knowing anything is happiness. So very simple. It is your forgiveness that will bring the world of darkness to the light. It is your forgiveness that lets you recognize the light in which you see. Forgiveness is the demonstration that you are the light of the world. Through your forgiveness does the truth about yourself return to your memory. Therefore, in your forgiveness lies your salvation. Illusions about yourself and the world are one. That is why all forgiveness is a gift to yourself. Your goal is to find out who you are, having denied your Identity by attacking creation and its Creator. Now you are learning how to remember the truth. For this attack must be replaced by forgiveness, so that thoughts of life may replace thoughts of death. 02 Mar 2015 Comments Off on W-61: I am the light of the world. W-61: I am the light of the world. In 2011, this is what I journaled for Lesson 61: I am the light of the world. I imagine God’s Heavenly Light streaming down from above, entering my crown chakra and pouring through me. A three-dimensional light activates my pineal gland, then my spiritual eye, then my throat, heart, solar plexus, dan tien and root chakra. This light looks like the chandeliers at the Metropolitan Opera House. God gives them a spin with His Hand like twirling a dreidel and I alight from within. I am lying on my back in supta baddha konasana and offer Him my hands and feet as well. My palms and soles sparkle to life with diamond light energy. I am alive. I am activated. I am the light of the world. That is my only function here. To shine with Love. That is why I am here. I also love how today’s lesson defines arrogance and humility. The ego mistakes humility for self-debasement. But true humility is to accept God’s assignment for us that we are the light of the world, the bringers of salvation through His Guidance. How exciting to find out that Lesson 61 is the first of a number of giant steps we will take in the next few weeks! We are the light of the world. In 2015, this moment, it is known that Light, not the body, is true Identity. “Light” is just a word that tries to describe the real state of Mind from which we spring. The person does not even exist, not really. Losing interest in the person is the greatest liberation. I am the Light of the world. This “I am” is not personal. It is the first layer of identity, the first level of duality, the anandamaya kosha — the bliss sheath. “I am” is the point at which we emerge from God to view God and experience God. We have not yet chosen the ego. “Am” is God-Self. At this initial point of duality there is the ability to simply re-merge into “am.” It happens naturally when the memory of God within stirs, rubs the sleep out of its eyes, and realizes it is the Light, not the person. This is the culmination of undoing (salvation, forgiveness). This is the right-minded outcome of following Inner Guidance (grace, Holy Spirit). The Light of the world dispels all darkness and illusions. In doing so, it reminds Itself it is the Light. 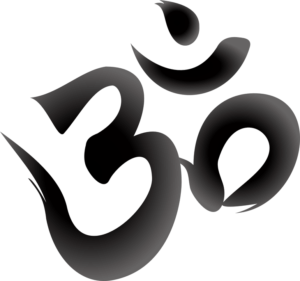 Aum. I am the light of the world. That is my only function. That is why I am here. Be sure both to begin and end each day with a practice period. Thus you will awaken with an acknowledgment of the truth about yourself, reinforce it throughout the day, and turn to sleep as you reaffirm your function and your only purpose here. These two practice periods may be longer than the rest, if you find them helpful and want to extend them. Today’s idea goes far beyond the ego’s petty views of what you are and what your purpose is. As a bringer of salvation, this is obviously necessary. This is the first of a number of giant steps we will take in the next few weeks. Try today to begin to build a firm foundation for these advances. You are the light of the world. God has built His plan for salvation of His Son on you. Listen to You Are the Light of the World, a brief yet potent mindfulness exercise. Let’s practice together! Watch and hear Amy reading each ACIM Lesson on Youtube. Also, check out Workin’ the Workbook, Amy’s online class which supports the ACIM Workbook practice. Forgiveness is the means by which Innocence is remembered. Forgiveness is the reflection of God’s Love on earth. It is God’s strength within that helps me to forgive. Everyone and everything everywhere are blessed when seen through the reflections of God’s Love. God’s Voice, the Holy Spirit within, is always with here, offering forgiveness, offering salvation. I walked steadily on toward Truth because there was nowhere else to go. Walking became being “walked” … and then … Quiet. There is not a moment in which His Voice fails to direct my thoughts, guide my actions and lead my feet. That is the only purpose for this body now. 1. (46) God is the Love in which I forgive. 2. (47) God is the strength in which I trust. 3. (48) There is nothing to fear. How safe the world will look to me when I can see it! It will not look anything like what I imagine I see now. Everyone and everything I see will leap toward me to bless me. I will recognize in everyone my dearest Friend. What could there be to fear in a world that I have forgiven, and that has forgiven me? 4. (49) God’s Voice speaks to me all through the day. 5. (50) I am sustained by the Love of God. Let’s practice together! Watch and listen to Amy reading each ACIM Lesson on Youtube. Also, check out Workin’ the Workbook, Amy’s online class which supports the ACIM Workbook practice. How can I be disturbed by anything when He rests in me in absolute peace? Let me be willing to exchange my pitiful illusion of seeing for the vision that is given by God. Given … ForGiven … ForGiving … Giving is Receiving … Giving is Vision … It is through Christ’s vision that I choose to see. I have tried to define what seeing is and I have been wrong. Let me welcome vision and the happy world It shows. God is the Mind with which I think. As part of God’s Mind, my thoughts are the thoughts God thinks, and God’s Thoughts naturally pour through “me”… Now! 1. (41) God goes with me wherever I go. 2. (42) God is my strength. Vision is His gift. Let me not look to my own eyes to see today. Let me be willing to exchange my pitiful illusion of seeing for the vision that is given by God. Christ’s vision is His gift, and He has given it to me. Let me call upon this gift today, so that this day may help me to understand eternity. 3. (43) God is my Source. I cannot see apart from Him. I can see what God wants me to see. I cannot see anything else. Beyond His Will lie only illusions. It is these I choose when I think I can see apart from Him. It is these I choose when I try to see through the body’s eyes. Yet the vision of Christ has been given me to replace them. It is through this vision that I choose to see. 4. (44) God is the light in which I see. 5. (45) God is the Mind with which I think. Listen to God Goes With You, a brief yet potent mindfulness exercise. Let’s practice together! 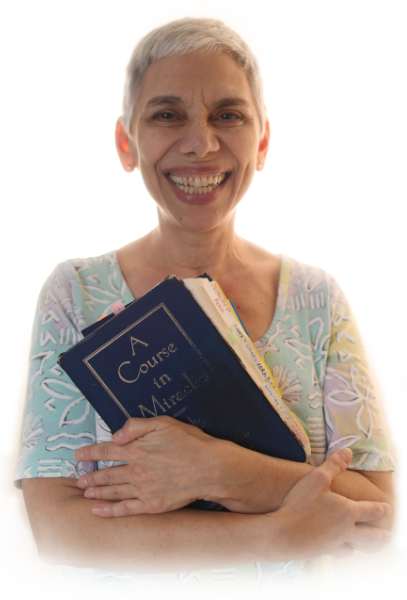 Watch and hear Amy reading each ACIM Lesson on Youtube. Also, check out Workin’ the Workbook, Amy’s online class which supports the ACIM Workbook practice. Tingles of Truth send little thrills up the spine and warmth through the heart as I read these review lessons. The theme is holiness and innocence; holiness and salvation; and holiness and Oneness. There is no longer any interest in identifying as “me.” The thoughts I hold about myself are Live Streaming from God; the person is the last to know and the first to go! Seeing the best in people has nothing to do with their personalities; it is only about seeing through personality to the illumined presence within. All rotten thoughts (and the resulting bad behavior) comes from fear. Judging nothing and no one leave an open Mind and open Heart. Being a conduit for holiness, love and blessings becomes the only response. “I am” blessed as a Son of God and consciousness re-merges in the Absolute. 1. (36) My holiness envelops everything I see. 2. (37) My holiness blesses the world. 3. (38) There is nothing my holiness cannot do. 4. (39) My holiness is my salvation. 5. (40) I am blessed as a Son of God. He understood that life inside the prison felt safe for him, and he was deeply afraid to face life on the outside. Only because he had a friend who gave him another destination did he have the courage to walk into the freedom which was rightfully his. My chains are loosened, says Jesus. I can drop them off merely by desiring to do so … and I do so desire …. The door is open and I can simply walk out! Just walk through the door … give up insane wishes … and walk into the Light! 1. (31) I am not the victim of the world I see. 2. (32) I have invented the world I see. 3. (33) There is another way of looking at the world. Since the purpose of the world is not the one I ascribed to it, there must be another way of looking at it. I see everything upside down, and my thoughts are the opposite of truth. I see the world as a prison for God’s Son. It must be, then, that the world is really a place where he can be set free. I would look upon the world as it is, and see it as a place where the Son of God finds his freedom. 4. (34) I could see peace instead of this. 5. (35) My mind is part of God’s. I am very holy. Do you assume you are a person? Is it a given that your body and your personality are “you”? That’s okay. It’s a huge turning point for every ACIM student when he or she “gets it” that everything is happening in the mind, not the body. Can you locate the mind? Try to put your finger on the mind. What is the mind composed of? Thoughts, beliefs, ideas, concepts. Can you touch thoughts, beliefs, ideas and concepts? As you contemplate this, notice whether a click of recognition arises … or fear. Recognition is the memory of God within you surfacing through ego-imposed clouds and darkness. Fear is the voice of the ego saying, “Don’t remember!” Don’t remember what? Who you really are: Spirit extending naturally from the Formless, Timeless, Changeless, Innocent, Unified God-Mind which is your Source. We need the Holy Spirit to undo our beliefs because, as people, we are stuck within a limited ego thought system which does not want us to understand that we can be cured of personal identity. This cure, to the ego, seems to be death. As the beloved master Mooji says, it is only death to what you are not, but What You Truly Are is Life and Life cannot include death. The cure for living as a person is to undo the person completely. The person cannot undo the person; it is the Holy Spirit’s job to unravel the tangled web we elected the ego to weave. Just withdraw your vote for darkness and complexity, and Light and Simplicity will naturally arise in the Mind of which you are an inextricable extension. Watch for my upcoming book, Sweet Dreams of Awakening. And let’s practice together! Watch and listen to my readings of each ACIM Lesson on Youtube. Also, check out Workin’ the Workbook, my online class which supports the ACIM Workbook practice. How can I know who I am when I see myself under constant attack? Pain, illness, loss, age and death seem to threaten me. All my hopes and wishes and plans appear to be at the mercy of a world I cannot control. Yet perfect security and complete fulfillment are my inheritance. I have tried to give my inheritance away in exchange for the world I see. But God has kept my inheritance safe for me. My own real thoughts will teach me what it is. Behind every image I have made, the truth remains unchanged. Behind every veil I have drawn across the face of love, its light remains undimmed. Beyond all my insane wishes is my will, united with the Will of my Father. God is still everywhere and in everything forever. And we who are part of Him will yet look past all appearances,and recognize the truth beyond them all. The ego-person does not know who she really is. The ego’s purpose is exactly that: to deliberately block true identity in order to maintain its illusion game. All material things are witnesses to the “reality” of the ego. Until grace arises within and we turn to the Holy Spirit. The Holy Spirit uses all that the ego has made for God’s loving purpose. The Holy Spirit now witnesses to Love, rather than fear. We are responsible for choosing the Holy Spirit and uncluttering the mind by giving Him all ego-thoughts. This one decision is all we need do. The Holy Spirit then undoes the ego’s trickery and the Truth is revealed in Its natural, illumined state of Mind. 1. (21) I am determined to see things differently. What I see now are but signs of disease, disaster and death. This cannot be what God created for His beloved Son. The very fact that I see such things is proof that I do not understand God. Therefore I also do not understand His Son. What I see tells me that I do not know who I am. I am determined to see the witnesses to truth in me, rather than those which show me an illusion of myself. 2. (22) What I see is a form of vengeance. 3. (23) I can escape from this world by giving up attack thoughts. 4. (24) I do not perceive my own best interests. 5. (25) I do not know what anything is for. The theme of Lesson 54 is that nothing is neutral. There is no such thing as neutrality or objectivity. Everything boils down to two subjective choices: separation or Unity. Separation or Unity can also be described as fear or Love; imprisonment or Freedom; suffering or Joy; abandonment or Embrace; conflict or Peace; many or One; death or Life, etc. The process of awakening to our true nature as Oneness is accomplished by choosing forgiveness. By giving everything we believe in, both bad and good, to the Holy Spirit, we re-establish connection with God. By holding onto what we believe in, we maintain the illusion of being entities separate from God. Jesus says, Life is Thought. But not the kind of thought we as people take for granted. God-Thought is an ongoing expansion of Life. Ego thought is analytical, interpretive, based on survival, in other words, anti-Life. Our state of mind can change simply by requesting that we see with God’s Vision rather than ego eyesight “Let me look on the world I see as the representation of my own state of mind.” This state of mind witnesses, or reflects, the teacher we have chosen: ego or Holy Spirit. The ego thought system mimics God yet distorts what it mimics in order to be “creative.” The ego “shares” the idea of separation by calling it multiplication and assuming that “more” is plentiful when actually “more” is divisive. The review of Lesson 18 tells us that even the mad idea of separation had to be shared before it could form the basis of the world we see. Happily, we can also call upon our “real thoughts, which share everything with everyone.” This “everything” is not material; it is Formless Love, Light, Harmony, Beauty, Peace, Joy … the everything of No Thing. We are not alone in experiencing the effects of which teacher we choose; we see and think accordingly: fear or Love. Knowing this makes us determined to see with the Holy Spirit’s Vision because aligning with God’s Will brings us Perfect Peace and True Happiness. “I would look upon the real world [the world the true perception of the Holy Spirit offers me] and let it teach me that my will and the Will of God are one.” Amen. 1. (16) I have no neutral thoughts. Neutral thoughts are impossible because all thoughts have power. They will either make a false world or lead me to the real one. But thoughts cannot be without effects. As the world I see arises from my thinking errors, so will the real world arise before my eyes as I let my errors be corrected. My thoughts cannot be neither true nor false. They must be one or the other. What I see shows me which they are. 2. (17) I see no neutral things. 3. (18) I am not alone in experiencing the effects of my seeing. 4. (19) I am not alone in experiencing the effects of my thoughts. 5. (20) I am determined to see.